This is the 28 pin SMD (SSOP) microcontroller used in our USB Host Board. You can now use any of the firmware we have for the USB Host board by using this chip on your own PCB design. 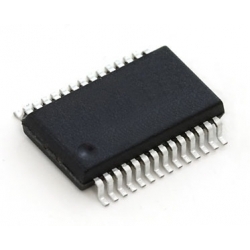 The USB Host IC is a Microchip 24FJ64GB002 microcontroller which contains a built-in full-speed USB host controller. This allows it to interface with and control most types of USB slave device - flash drives, keyboards, digital cameras, bluetooth dongles, and much more through the use of our preprogrammed firmware. The IC has a bootloader installed and loading of different (or updated) firmware can be done over a simple serial connection. The USB Host IC is designed to be as simple to use as possible. All of the complex USB programming is contained in the chip so there is NO USB coding required in your application. This saves valuable programming space and saves you from having to code and debug USB interface routines. Complete USB Software onboard. No USB coding required. USB Mouse - Read the movement and button clicks of a mouse via Serial TTL and I2C. PS3 Dual Shock Controller - Read the Joysticks, accelerometer, button pressure and buttons of a PS3 Dualshock Controller via Serial TTL and I2C. Set the LEDs and rumble motors. PS3 and PS4 Dual Shock Controller - Bluetooth - Connect to a PS3 or PS4 Dualshock Controller using its Bluetooth connection and read the Joysticks, accelerometer, button pressure and buttons via Serial TTL and I2C. Serial Driver for FTDI, CP210X, PL2303, CH340/1 and CDC - Allows you to connect a serial device that uses an FTDI, CP210X, PL2303, CH340/1 or CDC USB chipset to the Host Board and send and receive data. We have 2 wiring schematics available below. The first shows the minimal setup for the chip to function, while the other is the schematic for the USB Host Board which contains extra optional components. The EEprom on the USB Host Board is not needed for normal functionality. All settings will be stored in flash memory on the chip itself if the eeprom is not detected. The reason for the eeprom on the board is that the flash memory is erased when new firmware is uploaded, so settings will be lost (the settings will go back to defaults). The eeprom on the board avoids this. New software is easily installed over a serial RX/TX connection, so you will need an appropriate connection to your computer. We recommend the FTDI Basic breakout board but there are many similar boards and cables available. Connect up the Power and GND lines, then connect the RX on the Host IC to TX on the FTDI board and TX on the Host IC to RX on the FTDI Board. You are now ready to install the new software. If you are having problems downloading the ds30Loader program from the authors website, you can download a copy from our website here. Once you have these setup we just need to click the Write button (just below the Commands menu) and the software will attempt to connect to the bootloader and upload the new software. In order to make the bootloader active though, we need to reset the IC by briefly connecting the reset pin to GND. The reset pin is the pin 1 on the IC. This needs to be done a short time after clicking the Write button. See the screenshot below for an example. NOTE: DO NOT attempt to program the chip with a PicKit programmer or other similar programmer. If you do then the bootloader program will be overwritten. The bootloader is an integral part of the code and the chip will no longer function. The Bootloader program is part of our software anti-piracy feature - we do not make the bootloader program available for download.